External Tank-119 (ET-119) is lowered between two solid rocket boosters in preparation for NASA's STS-121 shuttle flight aboard Discovery. NASA's nextspace shuttle will launch no earlier than July 1 and without extramodifications to its already redesignedexternal fuel tank, the space agency said Friday. The spaceshuttle Discovery's STS-121mission, NASA's second test flight since the 2003 Columbia accident, willnot fly with modified, foam-covered ice frost ramps that cover the bracketsbetween vital external tank plumbing lines and its orange exterior. "It is notwithout risk to fly these ice frost ramps as they exist," said NASA spaceshuttle program manager Wayne Hale during a Friday press briefing. "[But]it is more appropriate to make one change at a time, to take care of thebiggest problem that we have." Discovery'sexternal tank has already been retrofitted to fly without a 38-foot (11-meter) protuberanceair load (PAL) ramp that once covered the pressurization lines and cabletray that run through the ice frost ramps. 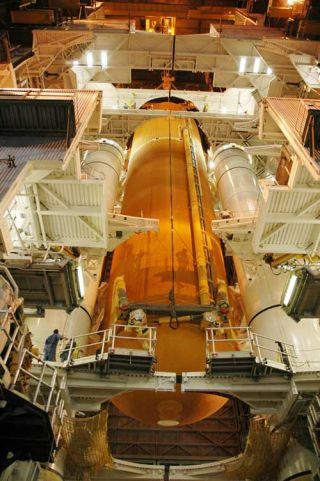 "Thatchange constitutes the largest aerodynamic change that we have made to thespace shuttle launch system since it first flew,"Hale said, adding that analysis of the PAL ramp fix on the entire launch systemwill likely continue well towards the liftoff date. While NASAis targeting July 1 to launch Discovery, the STS-121 mission has a flightwindow that stretches through July 19. After aseries of windtunnel tests, NASA concluded - with much debate among shuttle engineers - topress ahead with Discovery's July launch, shuttle managers said. "It was amixed conclusion," Hale said. "There were opinions on both sides." Shuttleofficials know that ice frost ramps can shed between two and 3.5 ounces(56 to 99 grams) of foam debris during launch, and admit that there isan element of risk associated with a July launch. In a worstcase scenario, in which a 3.5-ounce piece of foam pulls free from a key ice frostramp at the worst time and inflicts the most damage, it could prove a dangeroushazard to the shuttle and its crew, NASA said. "It wouldcause what we call critical damage," Hale said. Ken Welzyn,NASA's external tank chief engineer at Marshall Space Flight Center in Huntsville, Alabama, said there are 34 ice frost ramps on each shuttle fuel tank. Ofthose, only the top four along the tank's liquid hydrogen-bearing section are adebris concern during launch, he added. "Thermally,they warm up at time in the flight that debris poses a risk to the shuttle,"Welzyn said. But NASAdoes not currently have a viable redesign in hand for the ice frost ramps,shuttle officials said. "I expectin the next month to six weeks, we will have a really good design that we willimplement on subsequent tanks," Hale said, stressing that schedule pressure andthe need to completethe International Space Station (ISS) by 2010 did not push shuttle managersto proceed without an ice frost ramp redesign. "Thatdidn't drive this particular discussion," Hale said. "We're trying to makeappropriate decisions in light of the schedule, and not let it drive us tooverly risky or foolish decisions just to make a schedule that we know has sometime in it to allow for engineering problems to be solved." NASA hasbeen working to reduce the shedding of dangerously large pieces of fuel tankfoam insulation since the 2003Columbia disaster, in which seven astronauts and one orbiter were lostduring reentry. A1.67-pound (0.8-kilogram) piece of foam breached Columbia's heat shield atlaunch, leaving it vulnerable to hot atmospheric gases during reentry. Asimilar foam shedding event occurred during NASA's STS-114 return to flight mission,when a one-pound (0.4-kilogram) piece of foam poppedfree from the PAL ramp aboard Discovery's tank and flew past the orbiter'sheat shield without striking it. "We do havea serious concern with debris, particularly debris coming of the external tank,"Hale said. Spaceshuttle externaltanks are covered with about 4,000 pounds (1,814 kilograms) of foaminsulation covering their aluminum hulls to prevent ice-buildup - also apotential launch debris source - due to the super-cold liquid oxygen and liquidhydrogen they contain. Most of that foam is applied robotically, though about25 percent is still applied by hand, NASA said. The PAL andice frost ramp foam is among the hand-applied material. Commandedby shuttle veteran StevenLindsey, NASA's STS-121 mission will complete a series of shuttle repairand safety tests required before the space agency resumes ISS construction. The STS-121crew will perform at least two spacewalks - and possiblya third if shuttle resources permit - as well as ferry ISS crewmember ThomasReiter and a fresh load of supplies to the orbital laboratory. Hale saidhe was confident NASA could complete the ISS in the planned 16 ISS-boundflights before the space agency retiresits shuttle fleet in 2010. A 17th shuttle flight could servicethe Hubble Space Telescope by 2008, NASA has said. NASA chiefMichael stressed that 2010 is a fixed deadline for the shuttle program. "We have topick a year which will be the last year we will fly shuttle flights and stickwith that," Griffin said in the briefing. "And that's what we're doing."